World language study creates more positive attitude and less prejudice toward all people. World language study leads to an appreciation of cultural diversity. By learning about other cultures and languages, we gain an understanding about our own culture. By obtaining a second language, we become global thinkers and are able to compete in the global economy. amount of time outside of class is required for course work and study. Teaching and class discussion are in Spanish. *This is an interactive distance learning class which will be streamed live from Foresthill High School through the internet. The Spanish 1 Placement test will take place Monday, May 7th, 2018 in room 902 beginning at 2:10-4:00 PM. All students wishing to enter Spanish 2 must take this test. You must sign up by May 1 to ensure your reservation. Email Mrs. Adams at: eadams@puhsd.k12.ca.us. In this introductory class you will learn the language by listening and responding physically to commands. You will begin to speak naturally after considerable exposure to listening. You will learn to talk about yourself, friends and family, community, likes and dislikes, and activities that you enjoy. You will learn to communicate in a foreign language class where you and the teacher speak Spanish in class. In this class, you will learn to communicate more proficiently in the present tense and begin to speak in the past tense. You will be able to identify foods, discuss celebrations, apply computer vocabulary, etc. In addition, you will read about different cultural traditions from the Spanish-speaking world and will improve your writing skills. In this class you will develop a more advanced level of speaking by reviewing and significantly expanding acquired vocabulary and verb tenses. You will improve your reading comprehension and writing ability by using the present, past, imperative and future verb tenses. Increased class participation and informal conversation only in Spanish is required. In this advanced class you will become more proficient in the second language. You will continue to increase your vocabulary, study literature, compose compositions, and broaden your study of grammar. You will read literature representing the culture of the language you are studying and will learn to analyze and discuss topics evoked by stories. In this introductory class you will learn the language by watching (receptive skills) and then respond physically to commands. You will begin to speak/sign (expressive skills) naturally after considerable exposure to listening/watching. You will learn to talk/sign about yourself, friends and family, community, likes and dislikes, and activities that you enjoy. You will learn to communicate in a language class where you and the teacher speak/sign in the target language. In this class you will learn to communicate more proficiently in the present tense and begin to sign in the past tense. You will be able to identify foods, order in a restaurant and shop in a marketplace. You will improve your signing/expressive skills. You will only sign in class. 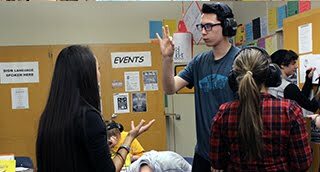 American Sign Language 4 is a dual credit course with Sierra College for students who have successfully completed ASL 3. ASL 4 reviews and builds on all material learned previously such as role-shift, signer’s perspective, classifier predicates, time, subject-object agreement, and loan signs. The class focuses on receptive ability of current events and stories, and expressive skills of storytelling and narratives.Vocabulary will include formulating opinions and decision making. Expressive and receptive skills are stressed in order to increase fluency and self-confidence in the target language. Students will receive college credit as well as high school credit for this course.